At the age of 15, George Washington became a land surveyor and, believe it or not, at the age of 21, our first President of the United States was a military spy for the British Army! 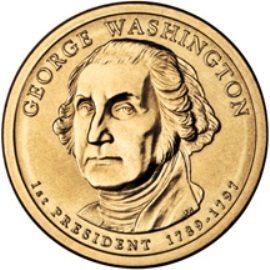 The obverse of this coin shows a portrait of him with his name inscribed above, and "1st PRESIDENT 1789-1797" written below. The reverse of the coin is the same on all issues. It bears a rendition of the Statue of Liberty, and includes the inscriptions “UNITED STATES OF AMERICA,” and “$1” for the denomination. Some other interesting facts include being the first president to appear on a postage stamp. He also owned six white horses and loved to go fox hunting.